Oh boy. Our short two-day trip to Austin was without a mission. 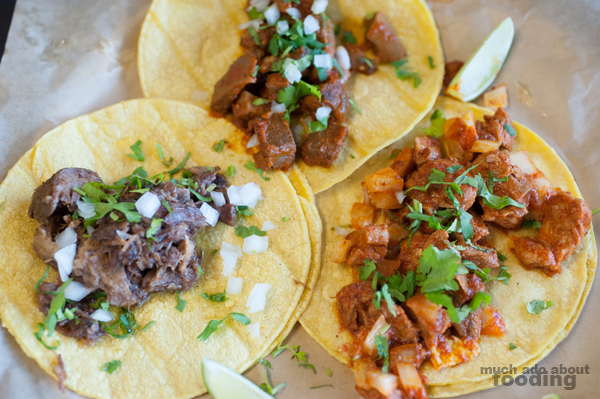 Duc needed tacos, and he needed to see how Austin did it. We learned quickly that the area was big on breakfast tacos so had to seek a spot that could make them well without all of the hooplah that comes with over-romanticizing the comfort food. It was authenticity we sought, and it was lines that we did not want to tackle. 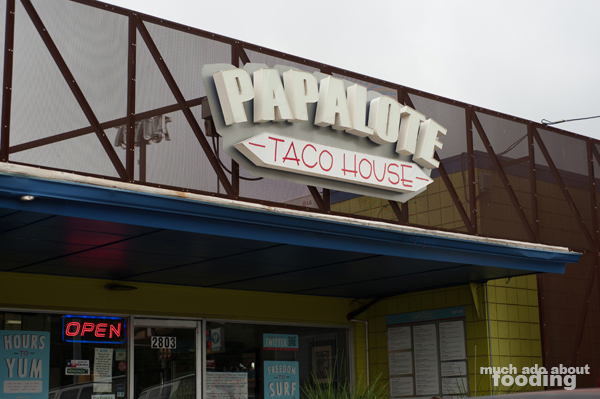 After some preliminary research, I settled on hitting up Papalote Taco House for its accolades and good reviews both for the breakfast and non-breakfast tacos. Our choice was confirmed once my cousins living in Austin told us they go there on weekends to sate their breakfast tacos needs. The moment we took our first bites as well, we were convinced we made the right, delicious choice. If we were closer to Papalote the day after we visited, I'm sure Duc would have tried to steer us in its direction again for breakfast because of how much he enjoyed their menu. We only opted for five when we stopped in but made sure to get a variety. It is a small-ish place inside but possibly because they are more focused on slinging out deliciousness than accommodating a large, spanning restaurant that would want food on the speedy. We had no problem with this because we want our food done well and done right. 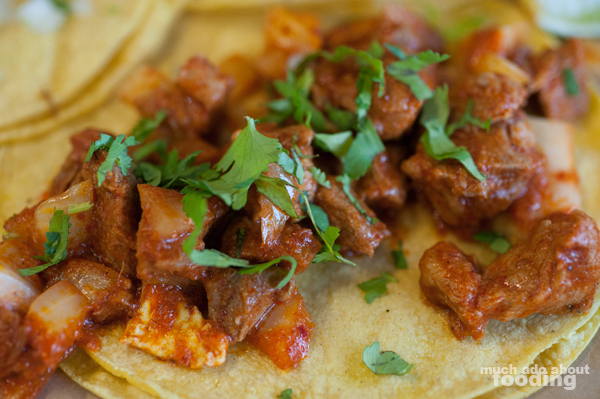 We started with the Pastor ($3.50 - pineapple huajillo-rubbed grilled pork) and Carnitas ($3.50 - pork marinated and cooked in its own juice) because those are typically our baselines for a good taco spot. Their tortillas were a bright yellow and softly pliable but left a little bit to be desired. It was the filling that made each dish. I loved the tenderness of both meats, especially the slight sweetness in the pastor from pineapple juices which gave brightness to every bite. We also shot for more traditional styles because we saw that they offered up the tastiness we desired. By that, I mean that Lengua ($3.50 - marinated beef tongue covered in our housemade red sauce) was a must-have as well as Tinga de Res ($3.50 - pulled beef stewed in chipotle, topped with plantains, cabbage, queso fresco, and a slice of fresh avocado). The Breakfast Taco ($1.99 - served on corn or flour tortilla with scrambled eggs and choice of two items) we opted for had chicharon and chorizo, chosen by Duc. 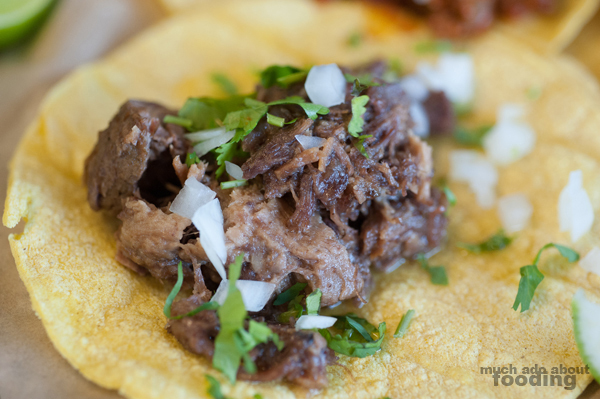 I'd have to say that their lengua wasn't the best I've had and their sauce had quite the kick to it which may have hidden some of its flavors. 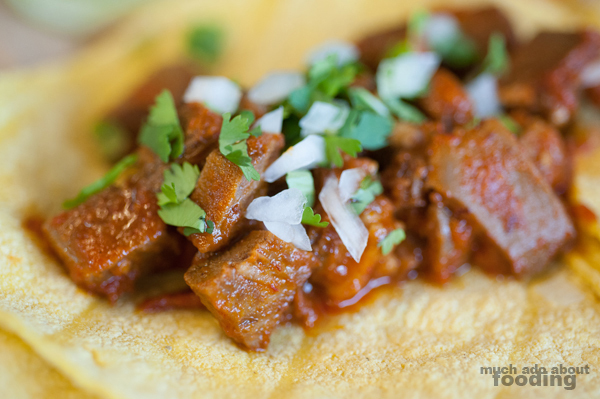 However, we both enjoyed their tinga which did also have some heat but a slow, smoky one versus the sharpness of the lengua. 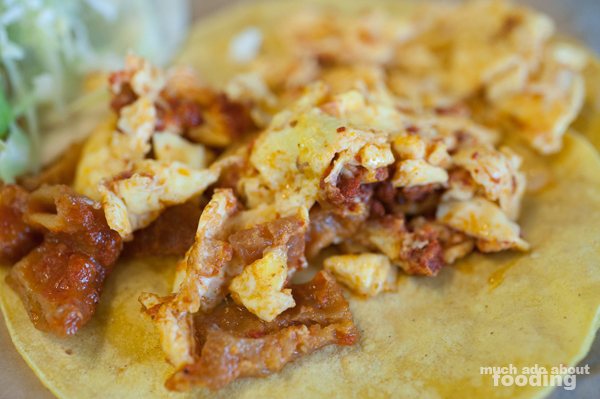 The shining star of the entire meal did happen to be their breakfast taco though; somehow, their chorizo and chicharon combination just had something special to it, and the eggs were perfectly scrambled and fluffy. 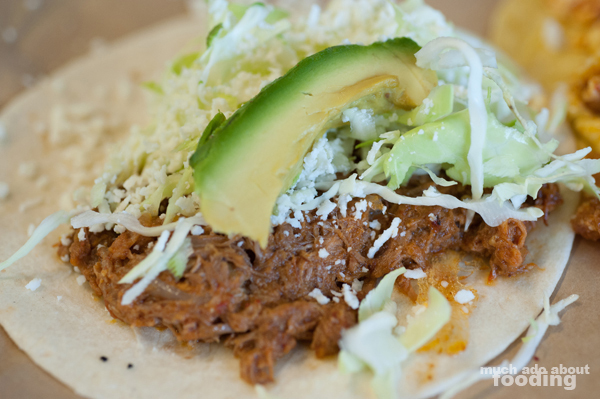 We don't have another marker to judge Austin tacos by but readily give the thumbs up to Papalote on the grand scale of taco-hunting!